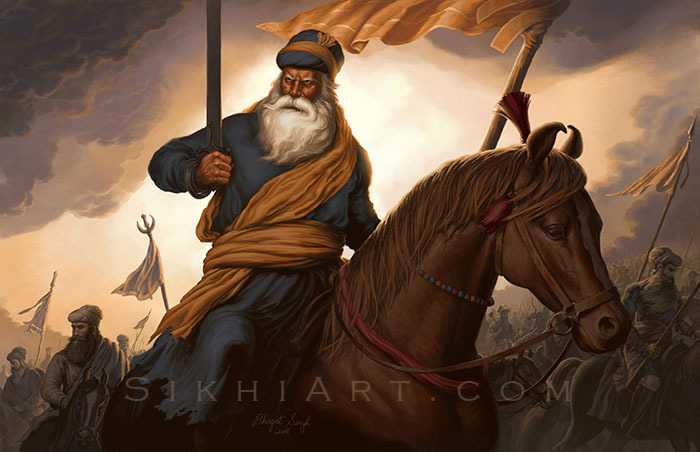 My painting of Baba Deep Singh ji shows him riding to battle, on horseback, leading a jatha of Singhs, with kesari nishan sahibs waving in the sky. 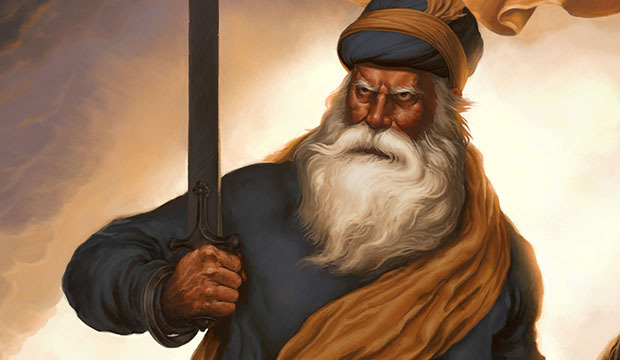 In his early years, Baba Deep Singh ji spent much of his time learning swordsmanship, getting disciplined, horse riding, and studying Sikh Scriptures. At 20 years of age, he got married and settled down for a while. A few years later, he helped to make copies of Adi Granth, with Bhai Mani Singh ji. This was back when copies of documents had to be penned down by hand. 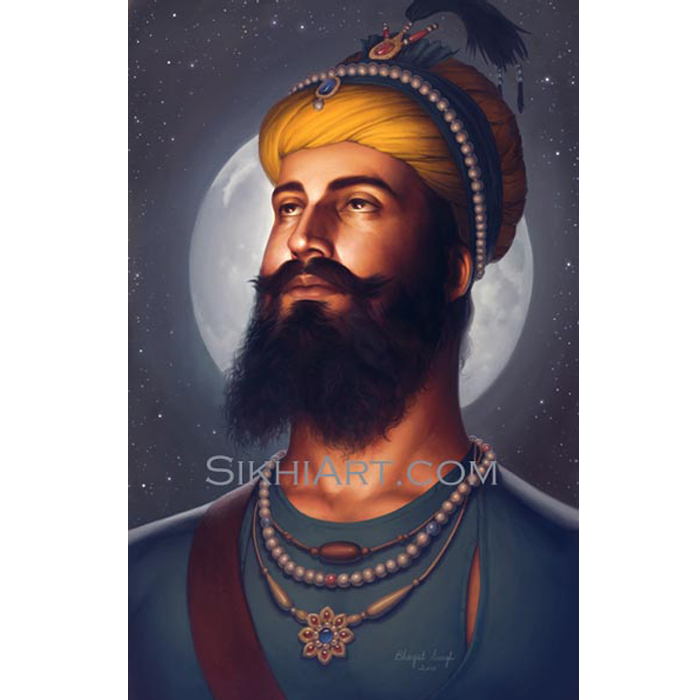 At 27 years of age, Baba ji was already fighting under Banda Singh ji Bahadur, in his campaigns against the Mughal government, who had persecuted its people and murdered the small children of Guru Gobind Singh ji. 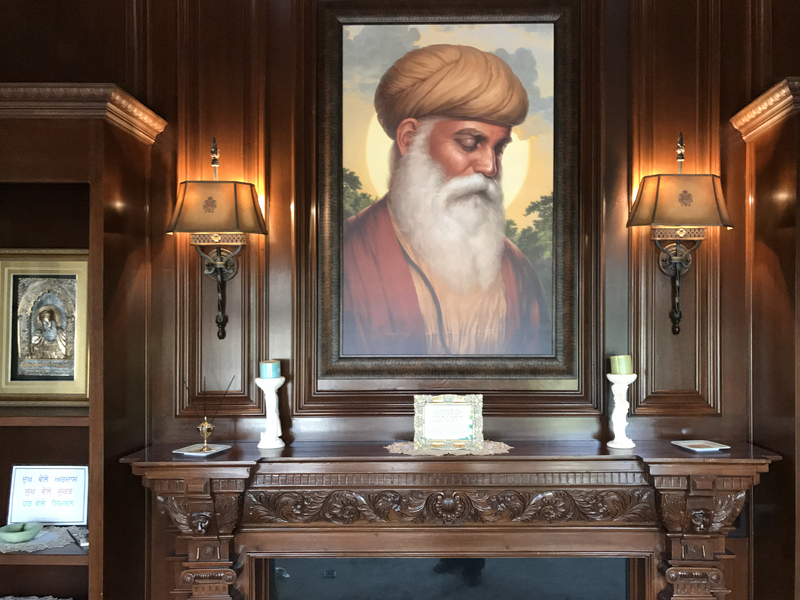 At age 51, Baba ji served under Nawab Kapur Singh ji. At age 66, he was given leadership of Shaheed Misl, after the 65 squads of Dal Khalsa army were reorganized into 12 Misls. At age 75, Baba Deep Singh ji was still going on missions, to protect his people, and to save his country from invaders who sought to steal its treasures, kill off the men and enslave its women and children. 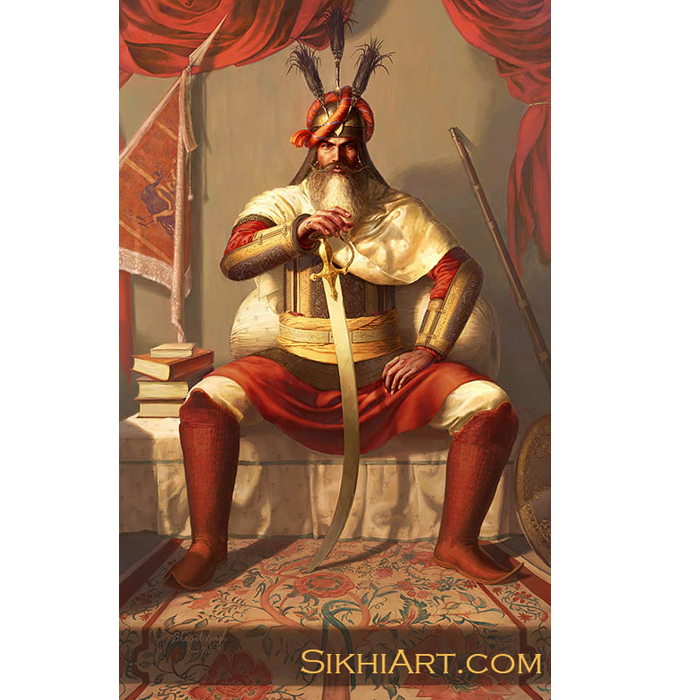 Ahmad Shah Durrani had attacked India multiple times, and Baba Deep Singh ji interrupted his fourth raid. Durrani suffered huge losses and decided to weed out the Sikhs. He demolished Shri Harimandir Sahib (Golden Temple) and filled its surrounding pool with slaughtered cows. When Baba ji heard of this, he gathered an army of 500 men at Damdama Sahib, Bathinda, and by the time he reached Taran Taaran, the number of men with him had grown to 5000. 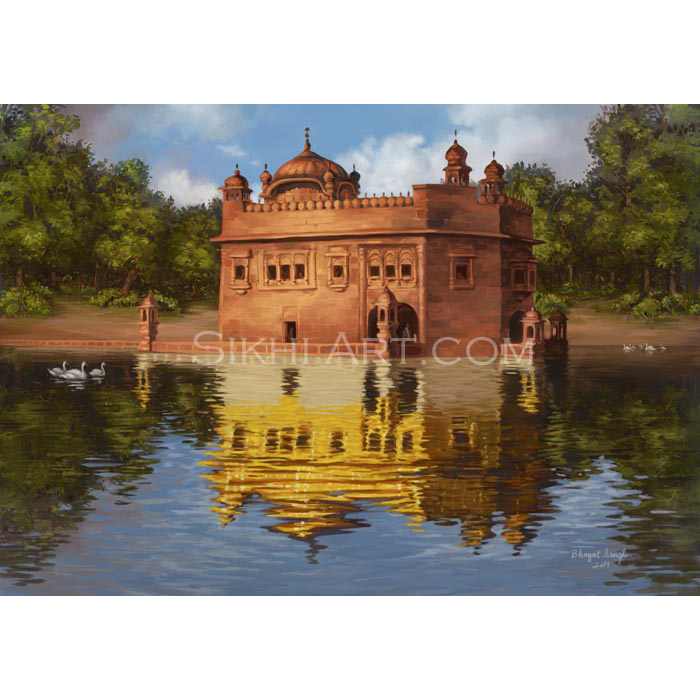 He then lead the men to Amritsar and fought Timur Shah, the son of Durrani. 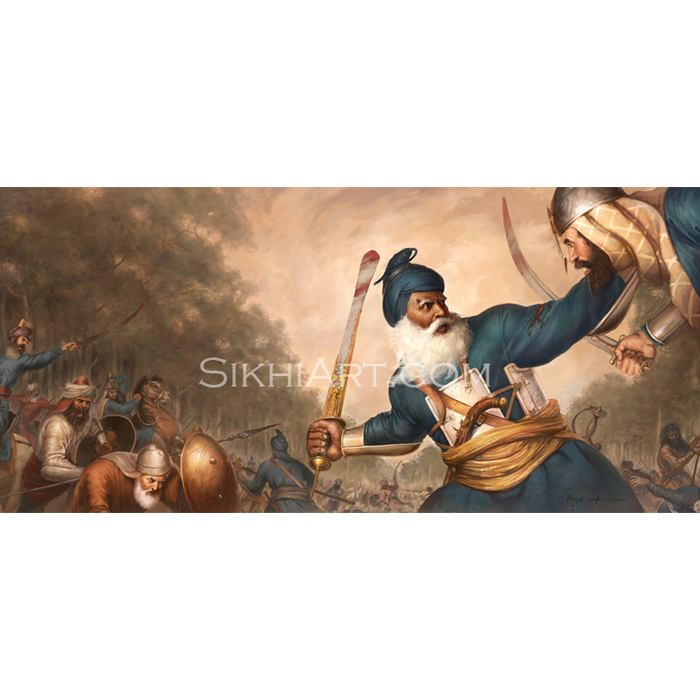 It is said that during the battle, the opposing commander decapitated Baba Deep Singh ji and his head fell to the ground. 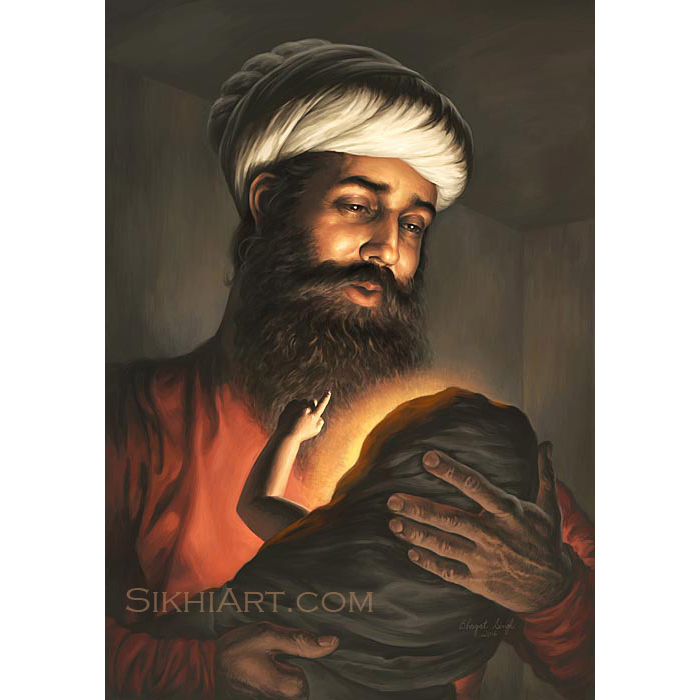 Baba ji picked up his fallen head and continued to fight, his body radiating with both fury and the chanting of Hari. 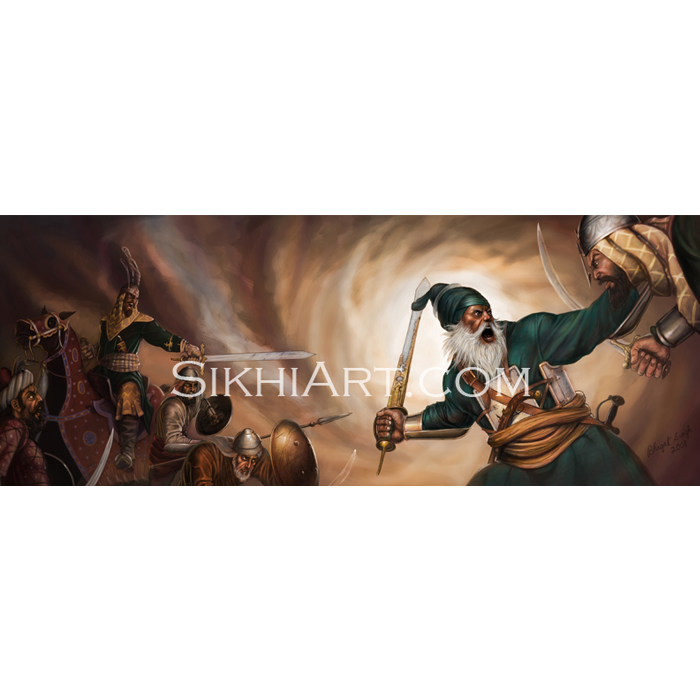 Carrying his head in one hand and his Khanda in the other, he fought until him and his men defeated Timur Shah’s army and dealt a severe blow to Durrani. 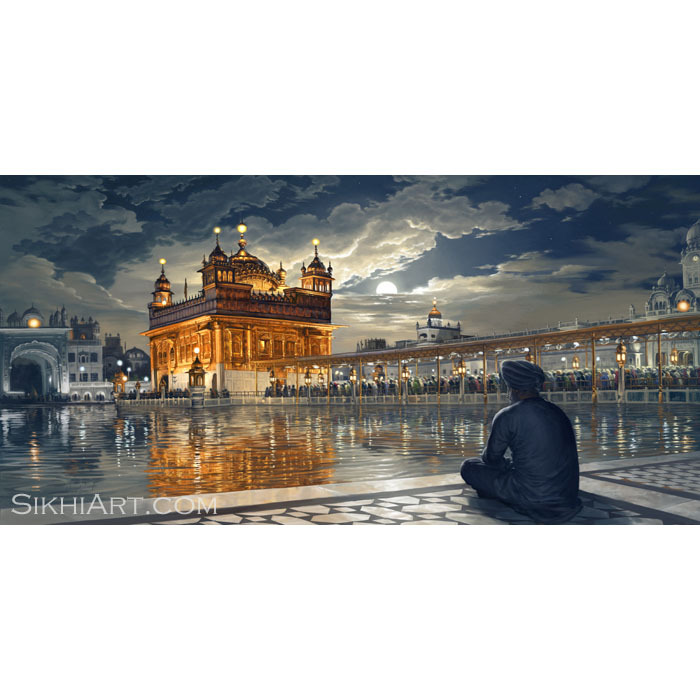 Baba Deep Singh ji had vowed to give his life, his head for Amritsar so after the battle ended, he reached the Harimandir Sahib, Golden Temple. He walked over to the edge of the pool, he put down his head, he bowed and attained liberation. 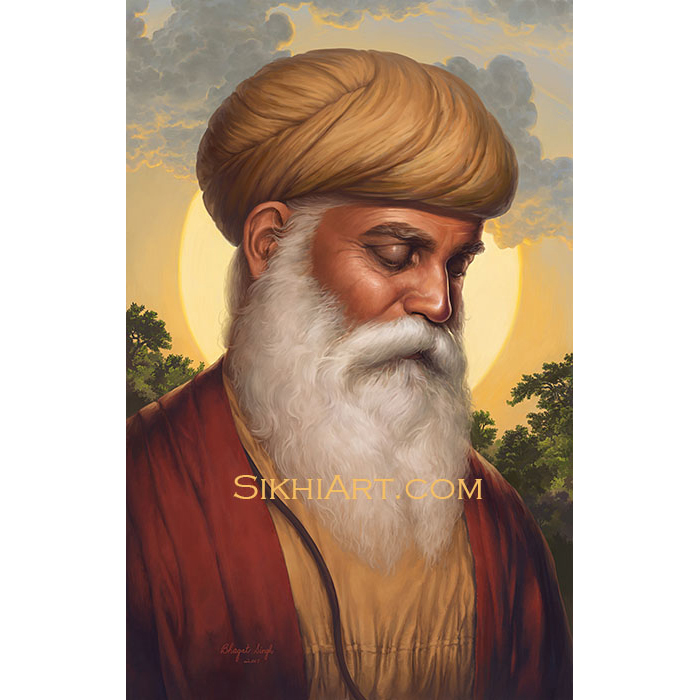 Baba Deep Singh ji is the son of Hari, the protector of Saints and the vanquisher of Evil. Those who meditate on Baba ji become proficient in martial arts and in their studies. Those who meditate on Baba ji radiate with energy and vitality. Those who meditate on Baba ji forget the distractions and become focused on their goals and achieving them. Those who meditate on Baba ji become masters of their skills and masters of their body and mind. Those who meditate on Baba ji attain Hari, the Master of the Universe himself. 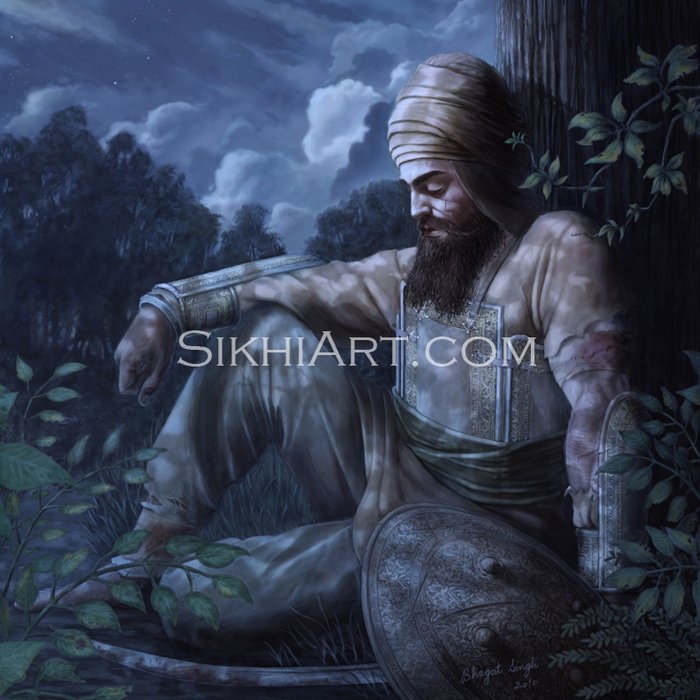 They do not have to meditate on anything else, those who meditate on Baba Deep Singh ji. 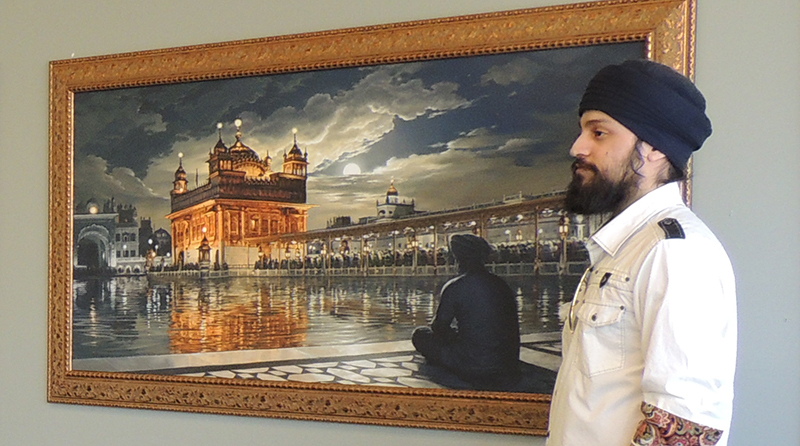 Support Sikhi Art and Gain access to Premium “Behind the Scenes” Content!